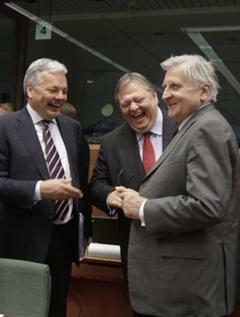 Belgian Finance Minister Didier Reynders, left, and Greek Finance Minister Evangelos Venizelos, center, speak with European Central Bank President Jean-Claude Trichet during a round table meeting of eurozone finance ministers at the EU Council building in Brussels on Monday, July 11, 2011. European officials are trying to work out a strategy Monday to prevent the eurozone's debt crisis from spilling over into bigger economies such as Italy and Spain, as they discuss details of a second bailout for Greece. "So what German or French bank will you be working for once we make sure these institutions never suffer a loss from a bad decision? Just heard Axel Weber got the chairman gig at UBS. Winning!"